Sound machines could be found all over the Internet, whether its the online shops or reviews. The offer is quite large and many different shops have them displayed and promoted lately. However, this might be the perfect one to start your sound adventure with. We do not say this with any reason. On a contrary – there are many to point out. …reflects its quality in price – which is great! Now, let’s elaborate all of these statements a bit further. Is it as good as it sounds? 5 Does Sound Sleep Machines Help and How? 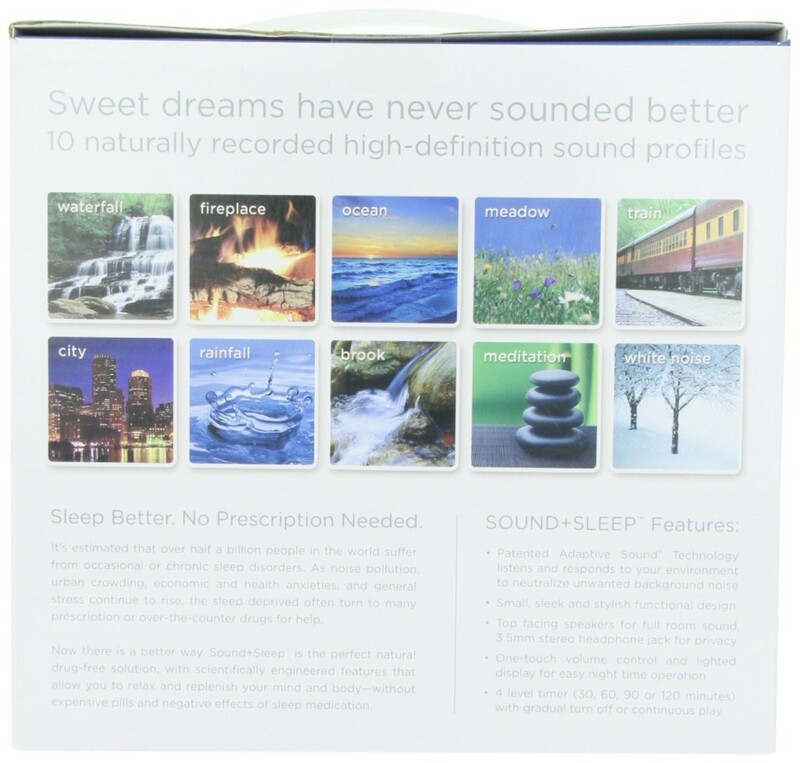 The Adaptive Sound Technologies created The Ecotones family of Sound Sleep Machines with a wish to provide the most realistic and natural sound environment ever. This way they aim to help people relax and sleep better, which seems to be huge problem nowadays when everyone is stressed, in a hurry and with no time for real rest. Each of their devices includes ultra-high quality sound recordings. Using ASTI’s patented Adaptive SoundTM Technology they successfully implemented the adaption feature, where sounds from the background are listened by the device and adjusted in case of any disturbance. Peaceful environment is now easily provided to all the Ecotones users. With only one click. The machine is well-equipped. Huge speakers are positioned upwards, so that whole room is filled with pleasant and natural sound. 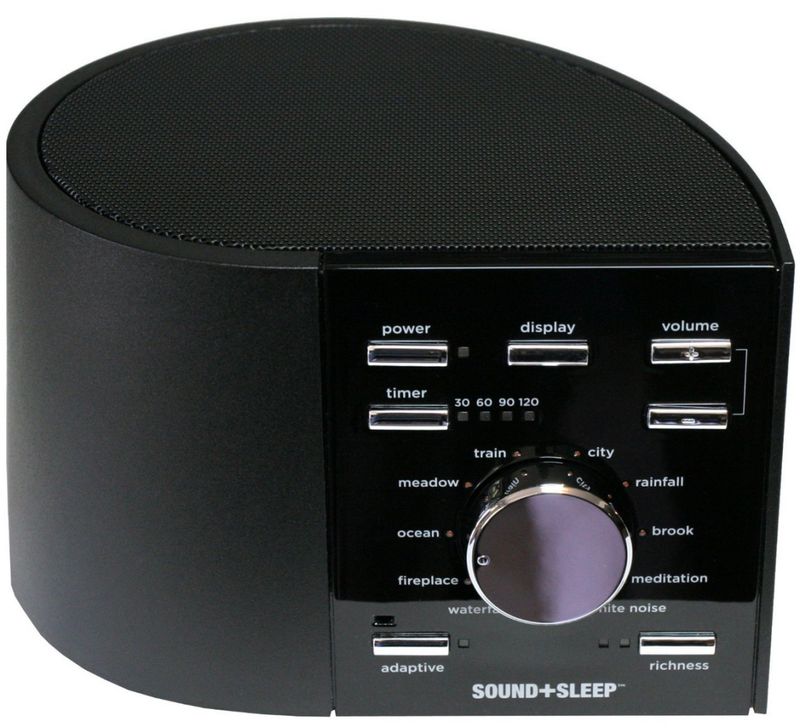 What is great about this sound sleep machine as well is the fact that each sound can be modified in three different richness levels. Another feature worth mentioning is display light, which can be easily turned on and off. And finally – timer. We cannot avoid mentioning it, as it is brilliant! With this timer feature, sound can be gradually turned off in certain period of time, whenever user chooses to. All of them are highly requested, popular and proved to be efficient in their purpose. From the entire list, it seems that white noise is the best option for those who have the hardest problem falling asleep. When it comes to pleasance – rain one and ocean one are on top of the list. Still, all of this is matter of a taste and user’s needs, so individual will know best which sounds suit his mood and state. When purchasing, each buyer gets the device, power adapter and instructions manual in the equipment box. Product dimensions are 6.3 x 4.5 x 5.5 inches, and its weight is 2 pounds. This makes whole ready-for-shipping package 2.6 pounds in weight. Ecotones Sound Sleep comes with a full one-year warranty for both parts and labor. In addition, 30-day return privilege is provided, which is not that often. All in all, giving this device a shot might be the best decision for light sleepers and anxious people. You cannot go wrong. ▪ Contains 10 most popular natural sounds. ▪ All sounds are high in quality and very realistic. ▪ There is Adaptive Sound Technology incorporated: it listens and reacts to the environment changes. ▪ Three richness settings control are offered for the best user experience ever. ▪ Sleep timer and display controls provide optimal night time operating. ▪ Both adaptive and manual operating modes are available. ▪ Device features display lights, as well. ▪ 1-year warranty is provided. ▪ Return privilege is included. + Ecotones Sound Sleep Machine model ASM1002 has sound adaption feature – it listens to the sounds in your background and automatically changes, insuring sleep without disruptions. + The speakers of the Ecotones ASM1002 are perfect – they are huge, good in quality and placed upwards. This way the sound is more natural, not harsh and quite pleasant. + The price of the machine is more than great. Considering what kind of the device it is and how beneficial actually can be – it can easily be considered cheap! + Display lights on the Ecotones are easily turned off. + It is small and handy – can be moved and taken everyone. We all have problems falling asleep when not home and this seems to be the perfect solution. – There are only 10 different sounds you can listen, so this can be placed into a con category. Wider offer would make this machine even more attractive and interesting. – Not having a port for headphones can also be put into category of negative characteristics. Many people like to listen relaxing sounds through their earphones, so this feature would be nice addition. Does Sound Sleep Machines Help and How? Before we jump to the conclusion about this particular machine, let’s talk sound efficiency as relaxation technique. Does it really help as all those articles state? The fact is this: even though you sleep, your brain registers and processes all the sounds in the environment on a basic level. Any kind of noise causes waking, moving, shifting between different sleep stages, or even changes in heart rate and blood pressure. These changes are slight, so people usually do not remember them next morning, but they happen. And therefore cause different conditions in your body. How much environment affects your sleep depends mainly on stage of sleep, time of the night and, more importantly, on your inner feelings about those sounds. But, if you have white noise turned on – it will have masking effect. It will block all the sudden changes that usually cause light sleepers to wake up, or will help fall asleep much easier. As this happens to be proved by many users, logical next step was creation of machines that transmit natural sounds. Those tend to improve sleep and general state of relaxation to all of their users. During time, offer evolves, and now we have multiple sound sleep machines on the market, all with different features and sounds. White noise, as we already mentioned, happens to be quite useful and popular, but many others are highly requested too. Such is the sound of rain or ocean. So, whoever finds sound of the rain calming and relaxing, waiting for the whether is not the only option. Turn on your sound sleep machine and enjoy. There are many different Ecotones Sound Sleep Machine reviews. All of them are, more or less, stating the same thing – this device will help you. And they do not lie. If you have problems falling asleep at night or if you have problems sleeping and resting during the day or if you simply have problems relaxing and staying calm – try these machines. Their effects are incredible. Not only they will make you fall asleep or become relaxed, but also make you enjoy in every moment listening to the sounds from the range. As each producer’s machine has different features and possibilities, finding the perfect one might be quite difficult. Therefore, follow the reviews. You will notice that every one of Ecotones sound sleep machine reviews has the same final thought on the product – it is worth the money. Main advantage of the Ecotones is its adaptive technology that makes the sound change and react on any disturbing happening in the environment. Apart from that, great thing is timer – no one wants its device to work all night long if there is no need. Even though this night mode is what some people – light sleepers – need. To conclude – there is so much benefits this device can bring you. It is useful, it is portable, it is good in quality and its price is reasonable. 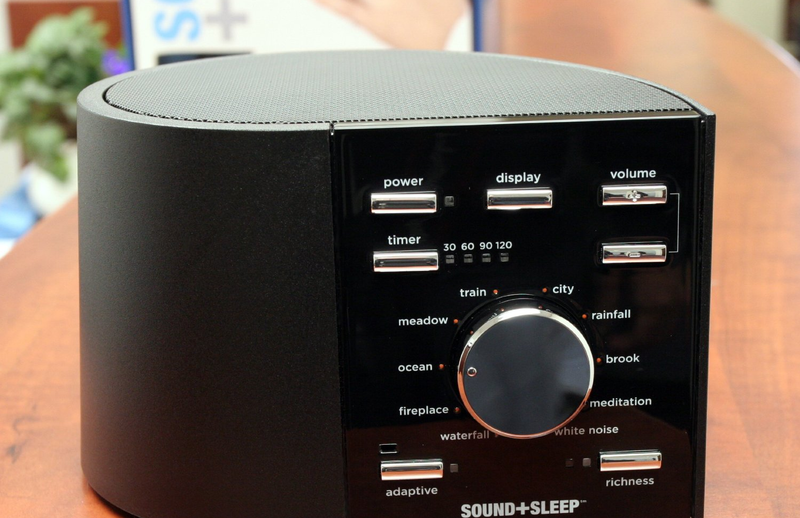 So, if you have troubles sleeping and relaxing, try this Ecotones Sound Sleep Machine ASM1002.